Sheltering Arms was founded in 1889 as the vision of a young woman named Rebekah Peterkin who made it her mission to help working families in Richmond, VA who could not afford to pay for healthcare. On February 13, 1889, with the help of her sewing circle and a few friends, she realized her dream in the form of a free acute hospital – Sheltering Arms Hospital. Though Ms. Peterkin died two years later, her friends remained committed to her dream. Local physicians and nurses gave of their time to see patients and an executive committee of ladies devoted their hearts and their time to keeping it running. They sought funds and supplies from those who could spare them, and made the hospital's first blankets by sewing newspapers inside cotton covers. By 1894, Sheltering Arms moved to Clay Street and this institution of caring was firmly established in Richmond. At Philanthropy and Philosophy, most of the causes we promote and recommend are National or International. We made an exception with Sheltering Arms, a regional organization, because of its long history and high rankings for efficiency, honesty, transparency and reputation. Over the years, thousands of people who could not afford to be sick were nursed back to health at Sheltering Arms. Continually looking for ways to meet the healthcare needs of the community, Sheltering Arms leadership began to scrutinize the health care environment in the late 1970s. With other acute care hospitals emerging to serve the community, Sheltering Arms discovered an unmet need and made the decision to specialize in physical rehabilitation. In 1981, Sheltering Arms became the first private free standing physical rehabilitation hospital in Virginia. Though their area of focus and specialization changed, the dedication to helping patients in financial need continued. Today, Sheltering Arms remains as unique as its history. Offering a full continuum of rehabilitation and health and wellness services, with state-of-the-science technologies, evidence-based recovery programs, expert staff and modern facilities, Sheltering Arms remains committed to helping all patients find the power to overcome the obstacles of injury and illness. Continually improving the delivery of effective, personalized rehabilitation services along a broad continuum of care at convenient locations to persons who need and will benefit from their services. Providing superior physical rehabilitation services to persons in financial need through prudent stewardship of available resources. Recognizing and addressing the needs of the person -- mind, body and spirit. Establishing and fostering viable relationships and alliances with other health care providers, funding sources, educational institutions, and providers of products and services who share common values. Sheltering Arms offers a network of rehabilitation and support services more comprehensive than any other in Central Virginia. Combining compassion and respect with the latest rehabilitation tools and treatment, organization is available to assist people to find the power to overcome and plan for a healthy future. Patient Services -- Case managers understand the details involved in planning and coordinating health care and are dedicated to helping people with this process. Sheltering Arm’s case management team is made of up registered nurses and social workers who can help with everything from connecting people with community resources, to assisting families in navigating the complexities of insurance, and arranging transportation for treatment. They strive to handle as much care coordination as possible, so people can focus their energy on getting better. Sheltering Arms’ case managers were recognized recently with a Case in Point Platinum Award honoring them for their dedication to educating patients and ensuring quality care. Occupational therapists at Sheltering Arms remain up-to-date on the latest research in their field to ensure they are offering the most advanced technology and treatment programs. They are focused on enhancing patient’s recovery and returning them to independence as efficiently and thoroughly as possible. At Sheltering Arms, one can take advantage of several new pieces of technology designed to help patients regain control and use of their arms, hands and fingers. Guided by an occupational therapist, rehab with these ground breaking tools may help patients make improvements long after an injury or illness. Fitness Services -- Fitness and wellness services at Sheltering Arms are designed to help people live a healthy and productive life. Whether one has a particular medical condition or simply is interested in maintaining good health through regular exercise, Sheltering Arm’s professional fitness specialists will work with patients to develop a health and wellness plan and provide guidance. They use a holistic, individual-centered approach to helping patient’s increase strength and fitness, decrease stress, relieve pain and improve overall health and quality of life. Fitness and wellness programs at Sheltering Arms are open to the public and do not require a physician referral. Recreation Services -- Sheltering Arms is dedicated to helping individuals regain as much independence as possible. This includes returning to the leisure and recreation activities one enjoyed prior to injury or illness. Recreation Therapists meet with each patient while in the hospital to discuss desired leisure activities and work on any modifications that may be necessary to participate in those activities. Recreation Therapists are also available to meet with patients one-on-one in the community to offer assistance in learning or re-learning a favorite leisure activity. They have the resources and knowledge to develop adaptations specific to their needs with the goal of helping them enjoy all of the things life has to offer. Community Services -- Understanding that patients want to know more about their health and how it impacts their daily life, Sheltering Arm’s clinical experts offer educational opportunities on a regular basis. The program takes stroke survivors and their caregivers through a series of educational and support sessions provided by Sheltering Arms rehabilitation professionals and experts in community resources. The sessions encourage progress, provide opportunities for patients to share their experiences, and lend support throughout the stroke recovery process. This support group meets the second week of each month and allows participants the opportunity to share unique stories, meet others in the area and discover/set new goals. Each session also includes an educational component with a guest speaker to provide information about health and community resources. Home Health Services -- With Sheltering Arms Home Healthcare, one can benefit from the trusted clinical programs and staff of Sheltering Arms in the comfort of their own home. Home health services are ordered and directed by the patient’s personal physician and overseen by Sheltering Arms physician Dr. Matthew Gibellato. Whether patients are already a Sheltering Arms patient or a patient with another facility, one can expect a seamless transition to the organization’s home healthcare services. 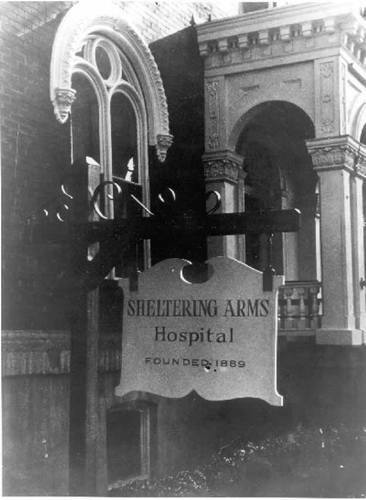 When Sheltering Arms first opened its doors in February of 1889, no one realized that it would become the tradition that it is today. The organization began as the vision of a young woman named Rebekah Peterkin. Moved by the suffering of those around her, Ms. Peterkin made it her mission to help working families in Richmond. 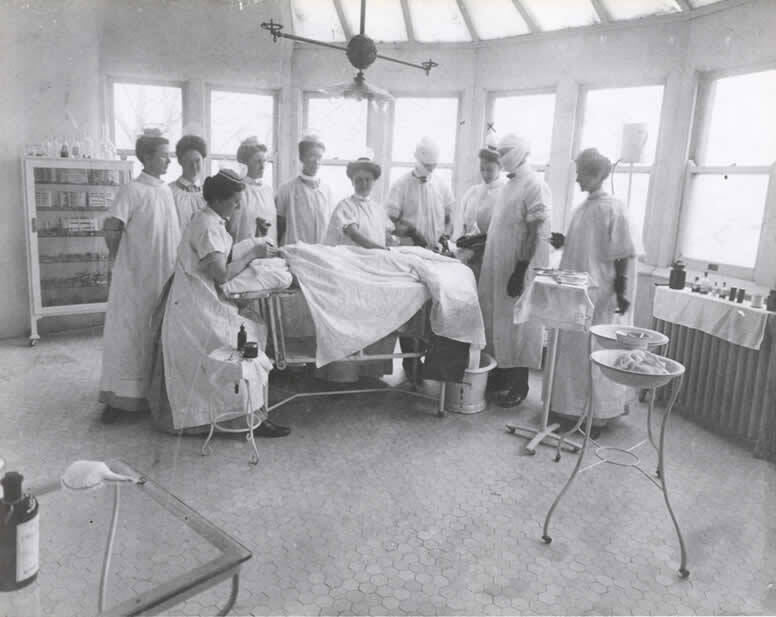 Local physicians and nurses gave of their time to see patients at the fledgling hospital, and an executive Board of women devoted their hearts and their time to keeping it running. They sought funds and supplies from those who could spare them and even made the hospital’s first blankets by sewing newspapers inside cotton covers. In 1894, Sheltering Arms moved to Clay Street, and this institution of caring was firmly established. Over the years, thousands of people who could not afford to be sick were nursed back to health at Sheltering Arms. Over time, it became obvious that the mission of Sheltering Arms was being filled by other organizations, but an unmet need still remained. In January of 1981, Sheltering Arms became the first private freestanding physical rehabilitation hospital in Virginia, and since then has been helping patients find the Power to overcome the obstacles they face due to illness or injury. Sheltering Arms has a proud history of serving the people of Central Virginia, and while the organization helps them in a very different way now than they did decades ago, their mission of improving lives has never changed. With these goals always at the forefront, Sheltering Arms is renewing its commitment to offering the best care to meet the rehabilitative needs of Central Virginia. The organization pairs leading-edge therapies with the compassionate hard work of its therapists to create the most comprehensive and extensive network of rehabilitation care in Central Virginia. Today, Sheltering Arms is made up of two hospitals, day rehabilitation programs, outpatient physician and therapy clinics, day recreation, support groups, and fitness and pool memberships and classes. In the late 1800s, visionary Deaconess Annette Relf realized more had to be done to help care for Minnesota’s youngest and most vulnerable citizens. As Minnesota’s first Episcopal sister, she founded Sheltering Arms Orphanage in 1883 and set forth on a mission to create a safe haven for abandoned or homeless children to be loved and cared for. Her work and love for children -- particularly those who were sick, homeless or poor -- made an impact on thousands of Minnesotans. Following her death, Relf’s legacy was carried on by staff, family and friends who were (also) committed to helping improve the lives of Minnesota’s children. The orphanage became a hospital caring primarily for young polio victims. After World War II, the hospital was transformed into a school focused on meeting developmentally disabled children’s needs. Sheltering Arms realized that Minnesota children’s need for assistance remained constant, yet their specific needs were evolving along with societal change. More and more non-profit organizations were forming to address specific needs of children and families in local communities. Public schools were playing a greater role in educating children faced with developmental challenges. Changes such as these prompted Sheltering Arms to reincorporate as The Sheltering Arms Foundation in 1983. During the last 30 years, the Foundation has awarded more than 650 grants, totaling over $10 million. A few years ago, the Sheltering Arms Foundation decided that in addition to funding direct service work on behalf of children, it wanted to impact public policy that impacted vulnerable children and families. They seek to affect public policy and larger systems impacting children and families and the non-profits that assist them. The organization also seeks to build public awareness on the changing landscape for children and families. Sheltering Arm’s does this by funding organizations to advocate on behalf of children, partnering with local and national organizations working to educate legislators, and by providing training opportunities for their grantees and other non-profits so they can advocate for themselves.